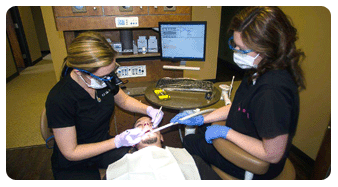 The most important part of dental treatment is preventing disease before it starts. At your initial appointment we will take a complete medical and dental history, check your blood pressure, and conduct a thorough examination of your mouth to detect any evidence of decay, gum disease or other common oral health concerns. We will then formulate a comprehensive treatment plan based on your oral health needs and with your vision of your ideal smile! Each treatment plan will be thoroughly discussed with you in a straightforward and comprehensible manner. All questions are welcomed, as we want you to take an active part in your care. We believe this will allow for the best possible results and your satisfaction with your overall experience here at Carroll Creek Dental. Take comfort in knowing our team practices within the OSHA (Occupational Safety and Heath Administration) guidelines, with state of the art sterilization equipment and an uncompromising approach to infection control practices.